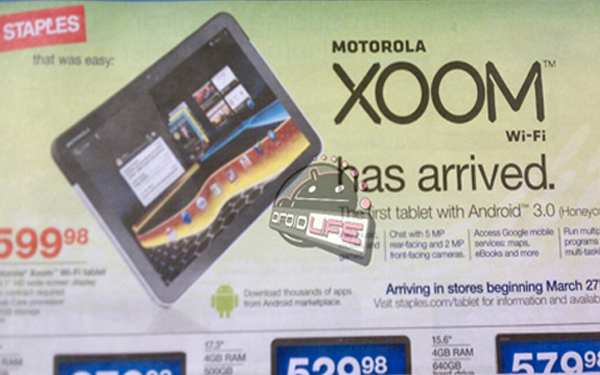 Taking things easily, Motorola Mobility confirmed the upcoming release of the Wi-Fi only XOOM model. On March 27, the company would launch the Wi-Fi only model tablet in the U.S. for $599. In an announcement, the device would feature a 10.1-inch display, same as the 3G model. Moreover, the tablet would also come powered with Android 3.0 Honeycomb operating system, a Google product specially designed for tablet computers. The Wi-Fi only Motorola XOOM tablet would support a 32GB onboard storage as well as a 1GHz dual-core processor. Currently, Motorola offers a 3G version of the tablet at a retail price of $799.99 without contract and $599.99 with a two-year agreement with Verizon Wireless, which is tagged way higher than the strong, powerful and one of the most successful, Apple’s iPad. With the company acting patiently and adopting the algorithm, wait-and-see, the Motorola XOOM would now directly act as a rival for Apple’s iPad 2. Apple‘s Wi-Fi only model starts at $499 for 16GB of storage while the 32GB Wi-Fi only model retails for $599. Rumors had been in the air for weeks on Motorola launching a Wi-Fi only version of the Xoom tablet. Motorola XOOM Wi-Fi model would be available via Staples and Sam’s Club while later joined by Amazon, Best Buy, Costco, RadioShack, and Walmart.